All transactions are safe and secure with a reliable history in online purchasing behind each of our associates. 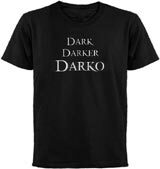 Buy the Dark Darker Darko t-shirts to own Donnie Darko clothing and merchandise. It's one of several taglines for the movie that was used heavily in the promotion of the film. This eye-catching shirt features a 3D style rendering of the phrase, which appears to emerge from the front of the black t, just as the emphasis on each word similarly builds in the phrase, "Dark, Darker, Darko." This cool tee is also available in navy blue, military green, and cardinal in addition to six different sizes. In addition to the Dark Darker Darko tees above, browse the Donnie Darko Clothing Gallery for more apparel like men's and women's clothes, kids shirts or hoodies.